Arthur C. Clarke once suggested that the invention of eyeglasses (an event that occured around 1350) may have actually launched the Renaissance by doubling the useful productive life of writers, artists and scientists. That salutary reminder that beneficial technology existed some time before the internet comes from The Size of the World by Jeff Greenwald, an author who has featured here before. His book has little to do with music but much to do with rethinking priorities, which is why we can learn a lot from it. But back to eyeglasses. Schubert was near-sighted and, apparently, always wore them, even while sleeping. Which, given that contact lenses were not available until the end of the nineteenth century, makes the numerous portraits of him not wearing glasses puzzling. I can find no pictures of Beethoven wearing glasses, but he did compose a Duett mit zwei obligaten Ausenglasern (Duet requiring two pairs of spectacles) for viola and cello. The title of that duet has never been explained, but does it matter? 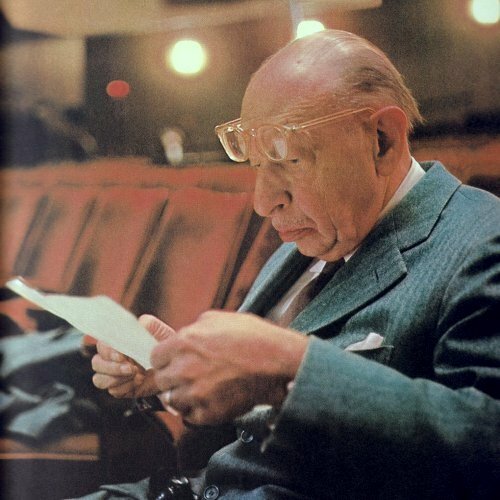 As a modern composer, who is associated with Stravinsky and does wear glasses, said about one of his own works, "That's a title given by the gods". I believe the word is Augengläsern - "eye-glasses," same as English. And "mit zwei obligaten" should be three words, imho. The Germans do combine words, but not all! Joe, thanks for that. I have corrected the article. Eventually I get there, with a little help from my friends.